I’m delighted to welcome Jenny Blake to our blog today. Jenny is known as Ausjenny in the online writing community and she is an Aussie reader who blogs about Christian fiction. Narelle: How did you come by the name Ausjenny? Jenny: When I first started on the Internet I was going to a scrapbooking forum and there was a Jenny from Downunder, and I started being Jenny from South Australia but it’s a lot to type. I cut it down to Ausjenny. It also was around the time I got the internet at home and had to have an email with eight characters. I was blakejennifer at one email but it was too long so Ausjenny was born. There are so many Jenny’s out there and a lot of Jenny Blake’s. I am Ausjenny on nearly all forums, and places including most of my emails. Narelle: What inspired you to start blogging? Jenny: I fell into blogging. When I first joined Shelfari I met Rel from Relz Reviewz and she told me how she has Aussie giveaways. From there I started visiting a few blogs and one of them was Camy Tang’s blog and she had a meme. To comment you needed to have a blogger account so I had that but it was the meme (list of questions you then send to others to fill in). That was Dec 2007, I was going to post book reviews at this stage. I guess I thought I would give it a go and see how I went. Narelle: Please share with us your favourite Christian fiction genres. Jenny: I am a historical fiction fan, I love history, never got to study it at school but love reading new facts. I am still waiting to use the trivia from a Gilbert Morris book in a trivia contest. The question is how did Roland Garros, home of the French Open, get its name. From the WW1 French Flying ace Roland Garros who helped invent the machine gun that didn’t shoot the propeller of their plane. Narelle: What do you think makes Aussie Christian fiction unique in a market full of books from the US? Jenny: Interesting question. The Australian voice is different from the American voice. Our speech is different in the way we say something and this comes out in our books. Things like the way we shorten words, use nicknames and just the names we use. I know some names in American books I have no idea how to pronounce or often have never heard of it before. Also it’s hard to tell where an Aussie comes from. In a book you can’t hear the difference in sound of dance. So can’t a Victorian from the rest of the country. There are a few words that are used in different states but not many where as in America there are distinct dialects. Narelle: What kind of things do you post on your blog? Jenny: I mentioned I am a member of a couple of blog alliances’ where I post the info on new book releases and at times will get to review some of these books also. I also post book reviews of books from alliance’s, books I have been asked to review for authors, and other review sites, and my own books I have read. I also have author interviews. Thursdays is normally Getting to know you Thursday where I introduce an author. Sometimes this will be a second interview to promote an author’s book. In December I normally have a Christmas focus. I also have giveaways often from the author. Narelle: What advice would you give a reader who was thinking about writing book reviews? Jenny: The main thing is write what you like about the book, how it makes you feel and maybe some of the issues it deals with. I try not to write about anything that happens after the first couple of chapters as it can give too much away. Often authors put surprises in books and it’s important not to mention this in a review. It can be hard as I often want to write about what I loved about the book and mention certain scenes but this will also give away parts of the story that a reader wants to discover on their own. It doesn’t matter if the review is only short just saying why you enjoy the book or if there is a reason you didn’t enjoy the book say why you didn’t enjoy it. Remember often the author will read the review and they like honesty. At the same time put the positive’s about the book also. Narelle: What’s coming up next on your blog? Jenny: Actually I have my Getting to know you Thursday’s interview going up today. I tend to post in the evening and I have a new author from America who is going to give a free ebook download to everyone who leaves a comment with an email address. I also have a giveaway of Beyond Resolution by Rose Dee coming up. Jenny, thanks for visiting with us today and giving us an insight into your blog. Jenny’s book giveaways are great for Aussie readers who are often excluded from entering book giveaways on overseas blogs. 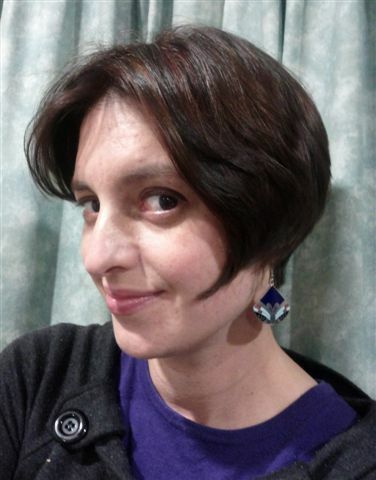 JENNY BLAKE (aka AUSJENNY on most blogs and forums) is an avid reader from Australia. She started a library at church with most of the fiction books being donated by her. When not reading she enjoys watching cricket, in fact you could call her a cricket fanatic, scrapbooking and cross stitch. She volunteers at the local Christian bookshop where she can recommend fiction to customers. She has a book blog where she reviews books and interviews authors. Her goal is to help promote new books and encourage authors. The deadline to enter our Bible Quiz and eBook giveaway is midnight on JUNE 5 AEST. Narelle here. We’ve extended the deadline for our Bible Quiz and Bible Study eBook giveaways until midnight on June 5 (Australian Eastern Standard time). We’re giving away 2 copies of our Bible Studies eBook People of the Old Testament: Adam and Eve, Abraham and Sarah. 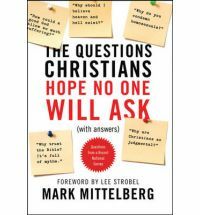 The first person to correctly answer all six quiz questions in the one comment on our May 28 Bible Quiz post will win an eBook and our quiz champion will be listed in our Honour Roll on the blog. We will do a random drawing to give away the second eBook. To enter the drawing, all you need to do is leave a comment on the May 28 Quiz post and attempt to answer at least one question. We will be announcing the Quiz winner and eBook giveaway winners on June 7. In June we will be featuring our new Bible Study eBook leader’s guide: People of the Old Testament: Judah and Tamar, Rahab. Natalie Sinclair is working to eradicate the diseases decimating whole villages in the Republic of Dhambizao when she meets Dr. Chad Talcott, a surgeon on sabbatical from a lucrative medical practice now volunteering at a small clinic. Meanwhile, things are unraveling in Dhambizao. Joseph Komboli returns to his village to discover rebel soldiers abducting his family and friends. Those that were too old or weak to work lay motionless in the African soil. When Chad and Natalie decide to help Joseph expose this modern-day slave trade—and a high-ranking political figure involved in it—disaster nips at their heels. Where is God in the chaos? Will Chad, Natalie, and Joseph win their race against time? 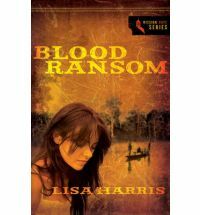 Romance and adventure drive Blood Ransom, by Lisa Harris, a powerful thriller about the modern-day slave trade and those who dare to challenge it. Narelle: Blood Ransom (Zondervan, 2010) was a 2011 Christy Award nominee in the contemporary romance category and I totally understand why. I read this book within two days and I was immediately drawn into Natalie and Chad’s story. Lisa Harris will be visiting our blog on Friday and we will learn about her ladies Bible study group in Mozambique. May Bible Quiz and eBook giveaway! Narelle here. We’re holding our first monthly Bible Quiz today. The first person to correctly answer all six questions in a comment on this post before the deadline of midnight on Tuesday, June 5 (Australian Eastern Standard time) will win a copy of our May eBook Bible Study of the month People of the Old Testament: Adam and Eve, Abraham and Sarah from Smashwords and they will be named our May 2012 Bible Quiz Champion. The winner will be announced in our post on Thursday June 7 and their name will be listed in our new Honour Roll on the blog. 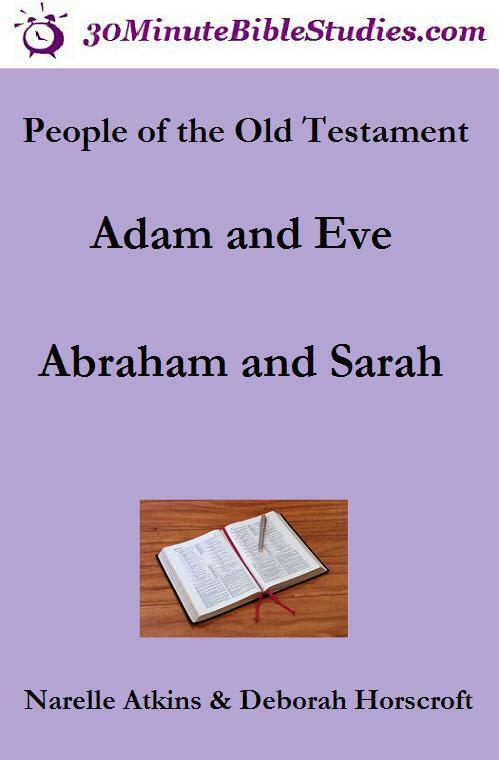 We are also giving away a second copy of our May eBook Bible Study of the month People of the Old Testament: Adam and Eve, Abraham and Sarah from Smashwords to a reader who comments on this blog post and attempts to answer at least one question in our quiz before the deadline of midnight on Tuesday, June 5 (Australian Eastern Standard time). You don’t even have to provide a correct answer to enter the drawing! And you can comment more than once to answer the quiz, although you must be the first person to include all six correct answers in the one comment to become our May 2012 Bible Quiz Champion. Only one entry per person will be included in the eBook drawing. Please include your name with your comment and leave an email address [ ] at [ ] dot [ ] where you can be reached or remember to check our Wednesday blog post. You can follow our blog by email, Twitter or ‘Like’ our Facebook page to receive notifications of new blog posts. We will do a redraw if we are unable to contact the giveaway winner within the next week. 1. Name the brother who Cain murdered? 2. Which one of Adam and Eve’s sons is an ancestor of King David and Jesus? 3. Which country did God ask Abraham to leave when He established their covenant? 5. What happened to Lot’s wife’s body to cause her death? 6. Who is the oldest man mentioned in the book of Genesis and how old was he when he died? I’d like to welcome Heidi Silberman to our blog today. 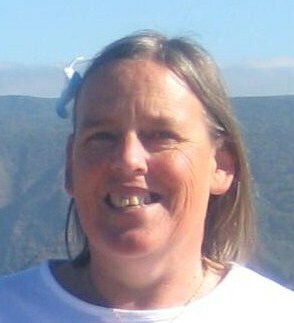 Heidi’s group is from Canberra, Australia and has 40+ group members. Heidi: Every Thursday during term time a group of about 40 women take over our church building. We chat over a cup of tea or coffee and a sumptuous spread of morning tea before dispersing to various hidey-holes in smaller groups to study God’s Word. It’s great to have this time of fellowship first and to feel like we are part of something bigger than the study groups of 6-8. Heidi: This term we have been able to choose which group to be part of. One is doing a “Back to Basics” of Christianity, another focusing on the roles of wife and mother and two groups (due to popular demand!) are studying the book of Romans. I’m in one of the Romans groups and I love that we can dig our teeth into what God has to say to us through Paul’s words. I appreciate being listened to and being free to open up – I admit I cry on a regular basis at Bible study! I also love being one of the younger women in the group as I learn so much from these amazing role models who have been on their journey much longer than me. Narelle: What do you like about your group and why do you think it’s important to belong to a Bible study group? Heidi: I asked some of my group members to share their thoughts on the group. Diana appreciates the gales of laughter that so often emanate from our corner of the building. She likes the freedom to share, to reveal weaknesses and fears and the affirmation she receives from hearing what others have to say. Liz likes our group because “everyone is wiser than me”. 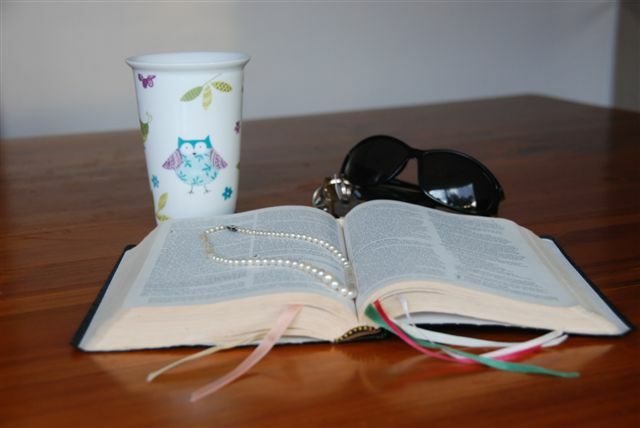 She believes it is important to belong to a Bible study group in order to keep focusing on God regularly and so she can support her Christian sisters both practically and in prayer. Cheryl likes the friendship that develops trust, bringing a freedom to share of ourselves. Shelley thinks it is important to be part of a group as God uses others in the group to confirm what He has been saying in other parts of our lives. Our group leader Robyn likes the insight that group members bring to our group. “People are not just saying the stock answer, but bring up things I hadn’t thought of.” She thinks it’s important to be part of a Bible study group because you can dig deeper than when studying on your own. Rebecca says “I love the fellowship with other sisters in Christ, the closeness we can share, the encouragement we can provide to each other, and the learning of God’s Word together. I love sharing the common goal with other women of seeking to become more like Christ and seeking His truth and answers in the Word.” Close knit fellowship and accountability isn’t possible on Sunday morning so a Bible study can fill that gap. Thank you Heidi for visiting with us today and giving us an insight into your group. HEIDI SILBERMAN lives in Canberra, Australia with her husband and four gorgeous kids. She teaches and performs improvised theatre and loves writing. She has written for community websites and anthologies and her first 10 minute play will be performed in August. Narelle here. On Saturday 26 May, Australians will have the opportunity to thank those who make a difference in their communities. Thanksgiving is an American tradition that is worthy of adoption. A few years ago Deb and I shared a traditional Thanksgiving lunch with our friends and Deb’s American neighbour. Traditional roast turkey, mashed potato, sweet potato (yams) with marshmallows, green bean casserole and pumpkin pie. All very delicious! We sat around the table and shared what we were thankful for as we enjoyed a beautiful meal. The National Day of Thanksgiving gives Australians an opportunity to celebrate and give thanks for our God given heritage as a nation, and to thank one another for the contributions each makes in our communities. It is a Christian based initiative, endorsed by Government and supported by numerous community groups, that provides the Church in Australia with the opportunity to give leadership in drawing local communities together to celebrate those values that bind us together as a nation. Outdoor and contracted workers in areas such as rubbish collection and road and park/garden maintenance. Chaplains in schools, hospitals, businesses and other organisations. Deb has been a school chaplain for a number of years and I’ll take this opportunity to thank her for the valuable work she does in one of our government schools. Thank you Deb! For the Aussies reading this post, who will you be thanking on Saturday? Are you involved in any National Day of Thanksgiving activities?